Last month I attended my first ever seed swap, Hereford seed swap to be precise. Having never attended an event like this I was a little apprehensive as to how they worked. Luckily my right hand man accompanied me (and held my bag while I browsed seeds!). It was pouring with rain on the day and the car park was full so we parked a little way away and ran to The Courtyard where the event was taking place. Upon entering we were greeted with a few small stalls selling gardening related items. In the centre of the room was a small round table with instructions on taking part in the seed swap and a donation bucket (did I mention the event is volunteer and donation driven?). After reading the instructions carefully we proceeded towards the ring of tables where the seeds were. The first item on the agenda is to give any seeds you have to go into the swap to one of the attendants behind the tables. 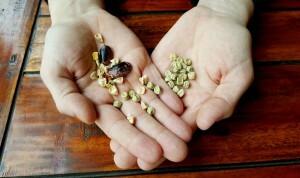 They will then distribute them to the correct areas with other similar seeds. I think the main idea is for gardeners to swap and share seeds they have grown and collected themselves and try growing something a little new but, I’m afraid I’ve not mastered seed saving (or even tried yet to be honest!) so I took a few seed packets from my collection that I wouldn’t be growing this year. The friendly gentleman behind the tables thanked me and told me to help myself to anything I liked. The tables were filled with little brown and newspaper packets holding everything from salad leaves to flowers. The first stop on my list was a large bag labelled sweetcorn. There were small empty brown envelopes for you to help yourselves to as many seeds as you required from the bigger bags. So I labelled mine up and took a handful of seeds. As I moved round I spotted a packet of kale seeds that I quickly snapped up. The final additions to my seed haul were a small pack of parsnips and chillies. The only item on my list I didn’t get were peppers. I don’t know why but I wasn’t expecting there to be anything other than the seed swap itself however, whilst I was browsing a group of people at the end of the room began to sing, it really was a beautiful atmosphere. There were several stalls with tools and plants and even a few information stalls. One stall was a tool sharpening man, if only I’d known he’d have been there! I sure hope he’s there next year! 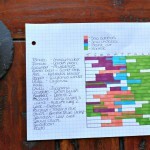 I have added seed saving to my list of gardening goals this year and look forward to next years seed swap event. I encourage anyone that has access to something like this to get involved. Has anyone else attended an event like this? I’d love to hear your stories.